A year ago my college roommate got married. She’s Indian, and the wedding was to be in Jaipur. When she invited me- I immediately imagined scenes a la Monsoon Wedding and knew that there was no way that I was missing this. It was an experience of a lifetime, replete with painted elephants and walls of strung marigolds. I came home with a saree that I will never figure out how to put on again, loads of bangle bracelets that will likely remain stacked in my jewelry box, the fading outlines of the mehndi that traced my hands and a fabulous splurge of an embroidered quilt that I had found at a lovely local textile store. The quilt (see images above) was old and worn, but beautifully stitched with paisleys, flowers and wonderfully naive images of wonky horses and people with little funny hats. Over tea and amidst stacks of other exquisite textiles, I was told that it was from Bengal and I was told what it was called, a hindi word I repeated in an effort to make it stick, but had forgotten by the time I plunked my new purchase on my hotel bed. The quilt now sits on a chair in my bedroom, where I can admire it and reminisce about my Indian sojourn. This week, my friend was in town from Bombay for a few days. During her stay, a colleague of hers, Darielle Mason, invited her to Philadelphia to tour an exhibition of Indian textiles that she had curated. Always a sucker for textiles, I tagged along. Little did I know that the show would be a visual feast of the very kind of quilt that I had carried home with me a year ago. Kantha: The Embroidered Quilts of Bengal from the Jill and Sheldon Bonovitz and the Stella Kramrisch Collections, on view at the Philadelphia Museum of Art, is a must-see for any fellow textile fanatics. 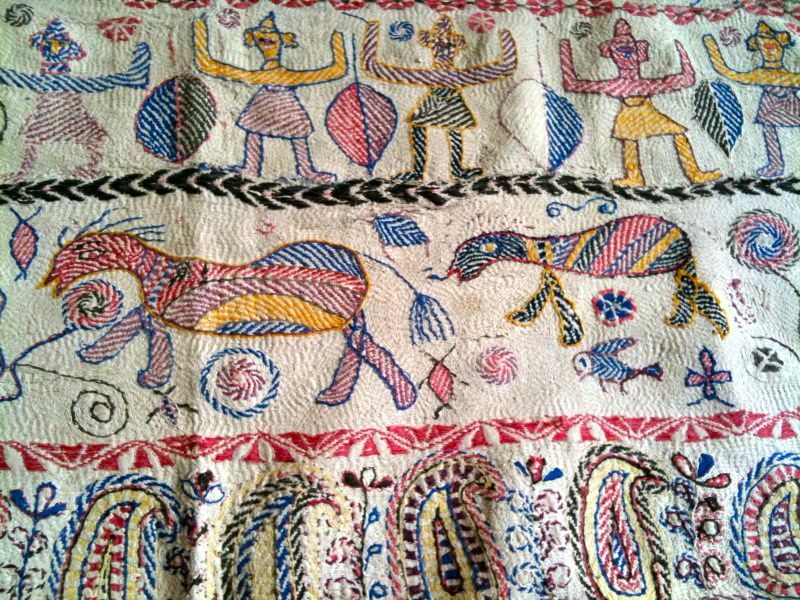 Kanthas are embroidered quilts traditionally created from the remnants of old garments and lovingly embroidered by the women of Bengal (a region today comprising of Bangladesh and the state of West Bengal in India). Kanthas were originally stitched as gifts for births, weddings or other family occasions. The Philadelphia Museum of Art exhibition of these unique textiles is the first to ever be presented outside of South Asia. The exhibition cherry picks the best examples from two private collections, displaying kanthas dating from the nineteenth century and first half of the twentieth century, when this vibrant domestic art flourished. Made by loving hands at home, the quilts combine a great variety of motifs, and often combine highly skilled and intricate embroidery with the wonderfully naive feel of child-like drawings. It is a small but jewel-like exhibit, with dark blue walls that make the kanthas pop like stain-glass windows. Darielle Mason, the chief curator and exhibition scholar Pika Ghosh, were on hand when I visited and spoke of the challenges of pioneering research on these vernacular textiles that have had very little documentation. 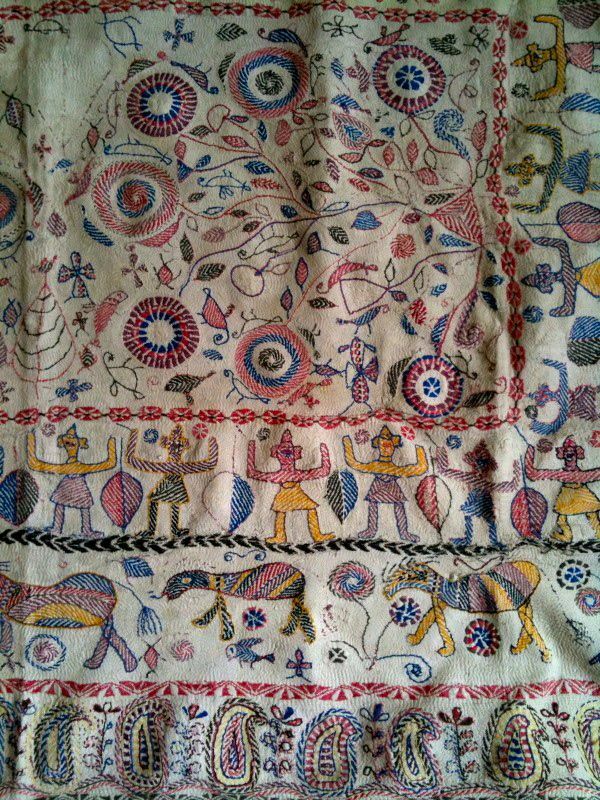 There is no prescribed design for kantha embroideries, and women often weave their own compositions filled with very personal takes on a variety of cultural and religious influences. Long since divorced from their owners, interpreting theur age, provenance and composition can be a task akin to artistic detective work. Both art historians became totally immersed in the project, and Darielle explained that she would often wake up in the night with an idea of how various images fit into the larger narrative, of both the quilts and the lives of these Bengali women. Pretty detailed piece indeed. I would like to include this one in my series about Indian handicrafts and arts, only if you permit. I’ll mention the credits on picture and on the piece.